The ability to mass produce music covers owes a lot to the invention of lithography. Lithographs were produced using wax or crayons to draw the designs on a specially prepared flat stone which was then inked. The earliest music sheets to be illustrated by lithography were produced in this country in about 1820 and were coloured by hand. After colour lithography took off in the late 1830s, coloured illustrations could be produced cheaply in large numbers. Several artists specialised in music cover illustration and the individual style of the artists can often be recognised from the design and date. Maxim Gauci, nicknamed 'the father of all music hall artists', he produced many of the early engraved and hand-coloured sheets. He died in 1854. John Brandard illustrated waltzes and polkas and other dances for the conductor Louis Jullien from 1844. Brandard’s illustration were beautifully done, with delicate colouring and were always printed on good paper. Alfred Concanen, famous for his witty representations of London life, is considered the most prolific of the music sheet artists. He was also was a book illustrator and regularly did line drawings for the Illustrated Sporting and Dramatic News in the 1870s. H.G. Banks worked with Concanen and was probably influenced by his style. He often used roundels and vignettes on his covers to illustrate several verses of a song. From 1877 he produced covers for publishers Francis Day and Hunter and was working at a time when the quality of sheets was in decline. It has been possible to buy the lyrics for your favourite songs since the invention of the letterpress in the 15th century when ballad sheets and engraved music were first printed. But it was not until the Victorian era that demand for illustrated music sheets reached the height of popularity. Ballad sheets like this were cheaply printed by letterpress, sometimes with woodcut illustrations. They were sold at fairs or on the street so that people could buy the words of songs that probably had well-known tunes. Early ballad sheets are quite rare as they were made of poor quality paper. Unless kept carefully, they would not have survived the passage of time. Charles Dibdin the elder who wrote this song was an actor, singer and composer who is best known for his patriotic nautical songs. His song 'Tom Bowling' is still performed today at The Last Night of the Proms. He was one of the most popular songwriters of the 18th century and composed over a thousand songs. Dibdin began his career tuning harpsichords for a music seller in London's Cheapside and went on to be a singer and composer at Covent Garden where his first opera was accepted when he was nine. He also worked with The Royal Circus. This early 18th century ballad sheet has woodcut images of trumpeters and soldiers at the top and a kissing couple below. These images represent the military and amorous aspects of the song's lyrics, in which love is seen as an inspiration during war as well as a reward at its end. Printers realised that pictures added appeal to their ballad sheets, and so began adding more than one image if possible. Sometimes they used the woodcuts they had in stock to illustrate more than one ballad sheet. The opera title Thompis is a printer's spelling error. This song actually came from was the medley opera Thomyris, Queen of Scythia, staged at Drury Lane in 1707. It was sung in English with words by Peter Motteux and music from airs by Alessandro Scarlatti and Giovanni Bononcini, arranged by the German musician John Pepusch who played the harpsichord at Drury Lane theatre. 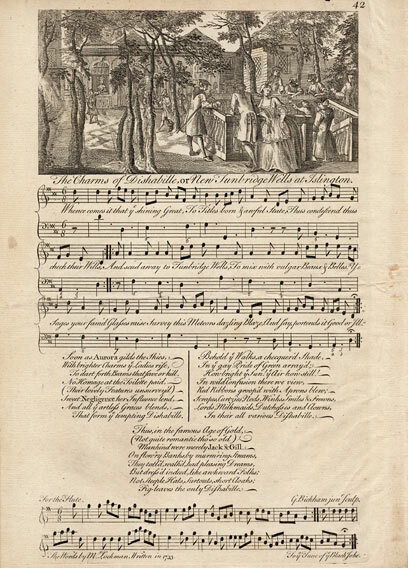 This is an example of an 18th-century music sheet, with a sophisticated image produced by engraving. There was a demand for the music as well as the lyrics on music sheets and this sheet has the piano part printed with a verse of the lyrics as well as the flute part. The image is larger than the woodcuts on early ballad sheets but image, words and music are still on a single page. This song is set to the words of a lyric poem written in 1733 by Mr. Lockman about the popularity of Islington Spa, or New Tunbridge Wells, a pleasure garden in Islington. One of London's smaller pleasure gardens, it was created after the discovery of a spring there in the 1680s. People believed that drinking the spring water would improve their health, and even members of the royal family were said to have tried it. Pleasure gardens were a popular form of recreation in the 18th century and one of the few public places where it was considered socially acceptable for men and women to meet. This is an illustrated music sheet from the 1830s, with the title and images on the front and music and lyrics inside. This was a progression from the single ballad sheets with one side showing both music, lyrics and images. Publishers realised that the power of an image would sell and this song sheet shows 14 images, produced through lithography. This is an early example of illustrations by John Brandard one of the masters of Victorian illustrated music sheets. The music sheet is for the song 'Oh England Is de Grand Place, or the Real Jim Crow', written by Alfred Bunn and sung by the comedian and singer Paul Bedford in the pantomime Harlequin Gammer Gurton at Drury Lane. 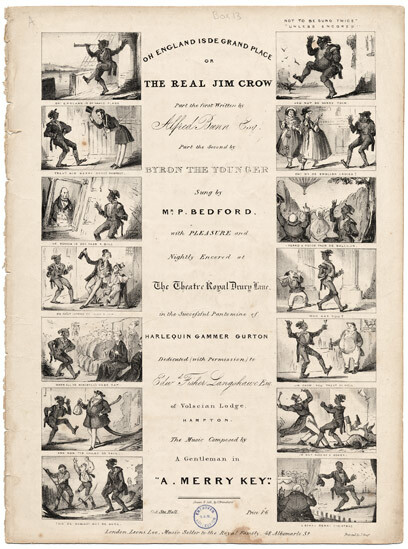 The song and dance in the pantomime was a parody of 'Jump Jim Crow', a song which became a huge 19th century hit in the United States. It was first performed in 1828 by the white comedian and minstrel Thomas Dartmouth Rice, blacked up as an African American. 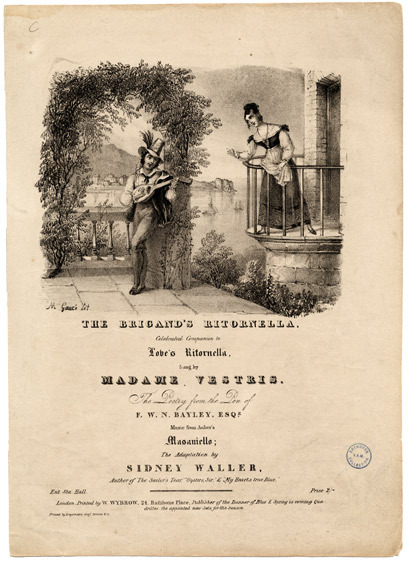 This music sheet was for 'The Brigand's Ritornella', a song with words by F.W.N. Bayley, a journalist who became the first editor of The Illustrated London News. His words were adapted to fit a tune from the opera Masaniello by the French composer Auber, which was first staged in Paris in 1828. The image shows the singer Madam Vestris on a balcony, being serenaded by her lover below. Music sheet publishers realised that images of star performers made their music more attractive and saleable. Madam Vestris was a hugely popular star of burlesque at the Olympic Theatre which she managed in the 1830s. It was at the Olympic that she became known for her 'breeches' roles when she dressed as a man in knee-length trousers and showed her legs - a daring thing for a woman in the early 19th century. The illustration is a lithograph by Maxim Gauci an important figure in the history of early music sheet illustration. 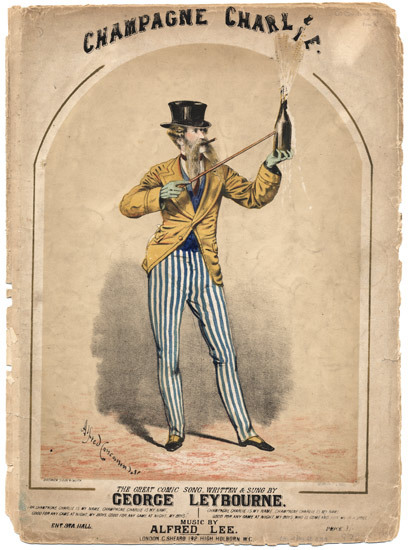 Nicknamed 'the father of music hall artists', he produced many early engraved and hand-coloured sheets. The invention of the upright piano in 1827 meant that even modest-sized houses (who could afford it) had room for a piano. The piano became one of the main forms of home entertainment long before the era of television and sound systems. 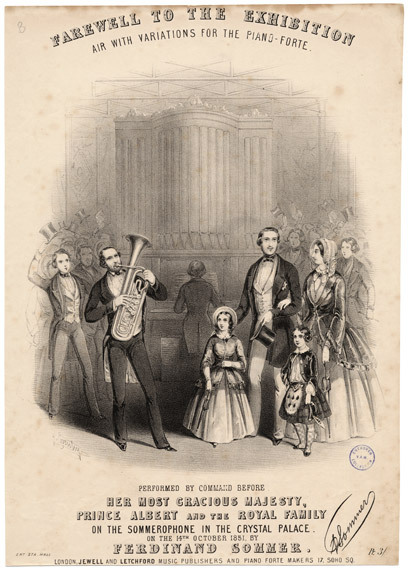 In the 1840s sheets of music and songs from popular plays and quadrilles, polkas, mazurkas and waltzes were firm family favourites. Victorian sheet music covered a huge range of themes. Songs and music from popular plays were often published. Because recordings were not available, buying the music sheets was the only way to play the music at home. 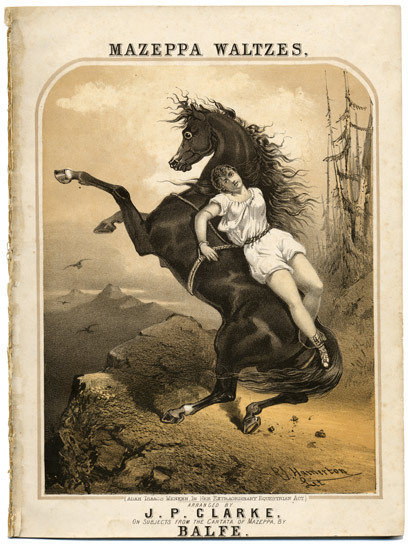 The American actress Adah Isaacs Menken made the equestrian drama Mazeppa popular in 1864. 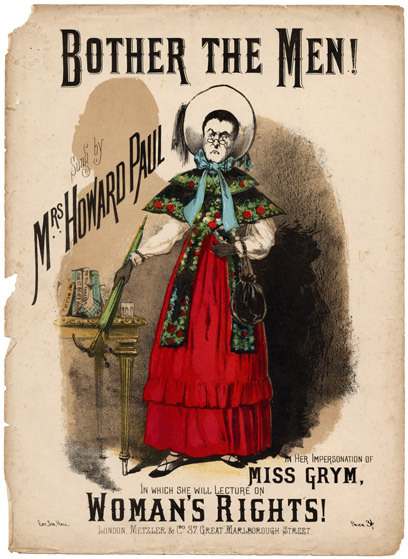 The musical Babil and Bijou, written by pantomime and burlesque writer Planché, was a success at Covent Garden Theatre in 1872. Topical events were also often marked with a song, for example the closure of the Crystal Palace in 1852. The Polo Lancers celebrated the new sport of polo. Romance, love and marriage were all popular subjects for songs. 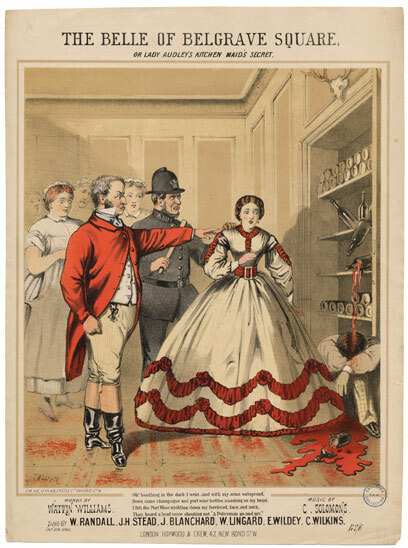 Music sheet covers could also be satirical and were often about topical events, fashions or political ideas, from London life to the wearing of bloomers or the Co-operative movement. This song sheet cover is from a cantata by Michael William Balfe telling the story of Mazeppa, the Polish nobleman who is tied to the back of a wild horse by his enemies. A cantata is a drama set to music, but not, as with an opera, intended to be acted. In 1861, the actress Adah Isaacs Menken caused a sensation in the role, playing a man, and appearing on the horse wearing little more than a flesh-coloured body stocking. She became so synonymous with the part that the cover to this 1865 edition of Michael Balfe's music features a picture of her in the part. The first performance of Balfe's Mazeppa was sung at Exeter Hall in June 1862. The episode with the horse was represented instrumentally, accompanied by the 'suffering accents' of Mazeppa. All the music was mysteriously stolen after that performance, never to be recovered. 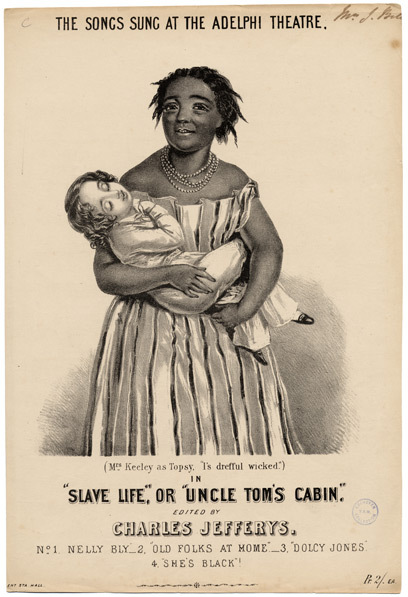 Uncle Tom's Cabin was an anti-slavery novel written by the American author Harriet Beecher Stowe in 1851. The book tells the story of the slave Uncle Tom, and the cruelties and harshness of his life. It was the first famous abolitionist work of fiction and became a stage play in 1852. The book stirred up great public feeling in the United States. Some even credited it with helping to start the American Civil War. Indeed, when Abraham Lincoln met Mrs Stowe in 1852, he said to her 'So you're the little woman who wrote the book that made this great war'. The book was dramatised in 1852 and played simultaneously at theatres across America. This music sheet cover is from the dramatisation of the novel. After its American success, the play opened at London's Adelphi Theatre in 1852. Meyer Lutz, the composer, was the musical director at London's Gaiety Theatre where Faust up to Date was first performed in 1888. The Gaiety was the home of burlesque under John Hollingshead and his successor George Edwardes and it later became famous for musical comedy. Faust Up To Date was one of a series of burlesques on popular plays and operas of the day, including Carmen up to Date (a skit on the opera Carmen), and Cinder-Ellen up to Date (a skit on the pantomime Cinderella). 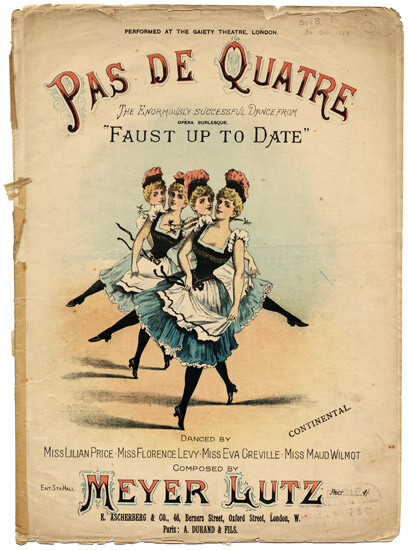 Faust up to Date was a skit on Gounod's opera Faust which had first been performed in London in 1864. The dance was performed by Lillan Price, Florence Levy, Eva Greville and Maud Wilmot and this illustration shows the short skirts which allowed them to dance freely and would have been very popular with the men in the audience. 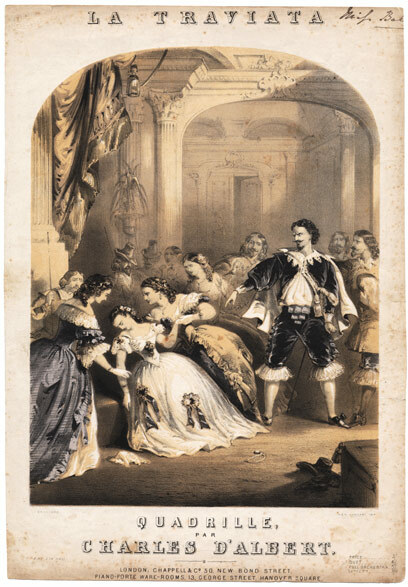 This music cover shows a scene from Verdi's popular 1852 opera La Traviata (The Courtesan). It was based on The Lady of the Camellias, Alexander Dumas’ fictionalised account of his affair with the courtesan Marguerite Gautier. In the opera, Alfredo falls in love with the courtesan Violetta but she gives him up when his father persuades her that the relationship is damaging the lives of his son and young daughter. This illustration, drawn by the master of the chromolithograph John Brandard, shows the scene where, believing she has betrayed him, Alfredo publicly throws money at her as payment for her services. The subject was considered so shocking that, when the opera was first produced in London, the setting was transferred to the 16th century, although, as this illustration shows, while the men’s and attendant women’s costumes were suitably ‘historic’, the prima donna is firmly dressed in the height of mid 19th-century fashion. Verdi's operas contain dozens of memorable tunes. Many melodies were arranged into dance form or transcribed for piano so that people could play them at home. 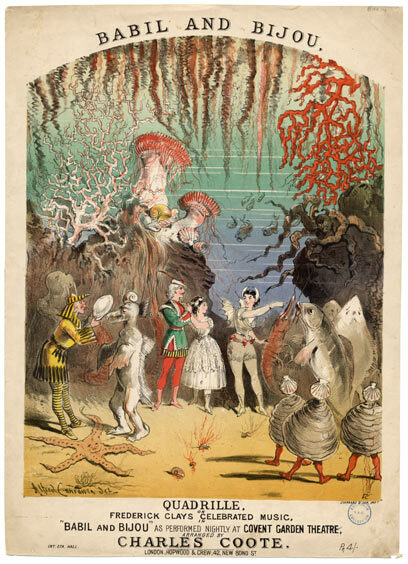 This image shows the underwater scene in Act III of the 'fantastic musical drama' Babil and Bijou, or, the Lost Regalia, when Babil and Bijou arrive in Octopalia and meet characters including King Cod, Salmon and Skate, Oyster, Captain Lobster, King Octopus and Walrus. 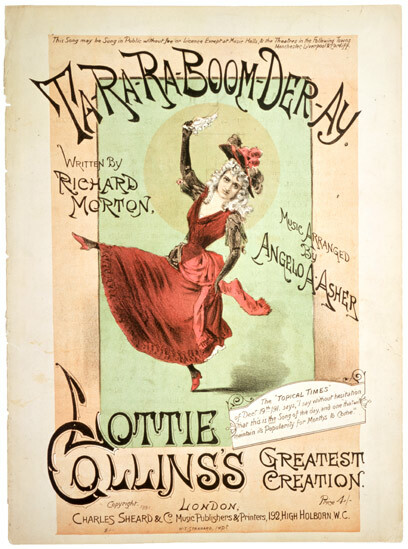 The music sheet was for a piano solo of a quadrille, dance music arranged by the prolific musician Charles Coote and based on tunes from the production. Babil and Bijou, by Boucicault and Planche, was a fairytale spectacle that opened at Covent Garden Theatre in 1872. It relied heavily on special effects as Boucicault's biographer, Townsend Walsh, described: 'An army of men, women and children took part. There were dancers, comedians, pantomimists, Amazonian warriors and coryphees galore, together with a huge aquarium of pseudo oysters, crabs, cockles, seals, periwinkles, sea-lions, sea-horses, sharks, alligators, sword-fish, devil-fish and lobsters - scarlet boiled lobsters at that; at the bottom of the sea.' Although a success with audiences, Babil and Bijou never covered its huge costs and ended its six month run £11,000 in debt. This music sheet depicts Ferdinand Sommer playing his 'Sommerphone' before Prince Albert and Queen Victoria at the closure of the Great Exhibition on 14 October 1851. The Sommerphone, named after its inventor in 1843, was the name given to the euphonium, a brass instrument used in American marching bands. 'Euphonium' is a name derived from the Greek meaning 'sweet voiced' and the instrument performs very well on low registers. The Great Exhibition was held at the purpose built Crystal Palace in Hyde Park, London. It contained 13,000 exhibits celebrating the industrial revolution and the British Empire including looms, kitchen appliances and even an envelope machine. There were concerts and circus performances held in the central transept, and the tightrope walker Blondin even walked across the central transept on a tightrope pushing his daughter in a wheelbarrow. 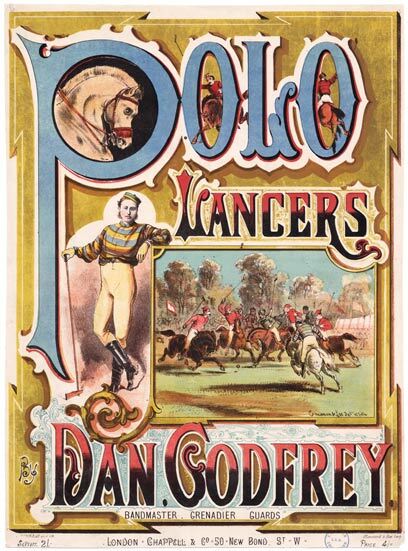 This music cover was for a topical song about the sport of polo which was introduced into the UK in the 1860s. In the 19th century it became a popular sport in the British colonies from where it arrived in England, although polo is thought to have originated in ancient Persia in 600 B.C. The first polo fields opened at the Hurlingham Club in London in 1874, where the first written rules of polo were established. Polo is traditionally seen as a sport for royalty and the wealthy because of the numbers of horses that each rider needs for one game. The first international polo championship was in 1886 between America and the UK. 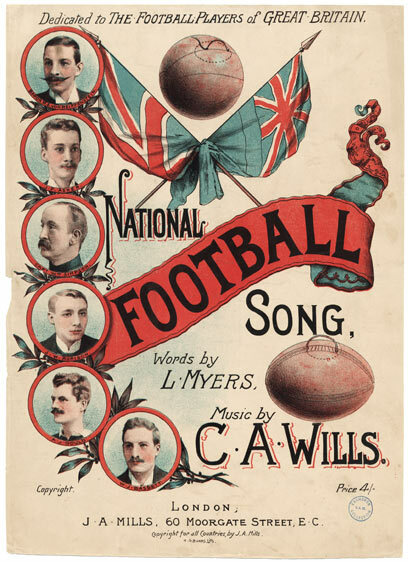 'The National Football Song' is a celebration of football, both Association football and Rugby football, and this music sheet cover depicts the David Beckhams and Johnny Wilkinsons of the day. Each named player is in a roundel (circular portrait), characteristic of music sheet designs by H.G. Banks. The two types of ball are also illustrated, above and below the flags. Both soccer and rugby developed from the same game but there was such confusion between those who played it as a contact sport and those who didn't that in 1863 there was a meeting of representatives in London to clarify the fundamental rules. It was after this meeting that those who played rugby-style football went their own way, and the Football Association was founded for those who favoured a game that forbade tripping, shin-kicking, and carrying the ball. In 1871 the Rugby Football Union was founded. One man illustrated here, A.J. Gould, who played for London before returning to his native Wales, is credited as having invented the idea of having four three-quarters in attack and defence. 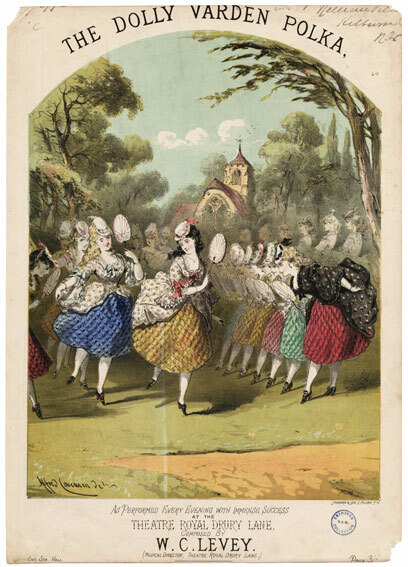 This music sheet cover illustrates 'The Dolly Varden Polka', performed in a production at Drury Lane theatre by dancers wearing 'Dolly Varden' dresses. In the 1870s the style of ladies' dress called the polonaise became popular again a hundred years after the original 18th century fashion. The polonaise was an overdress or open jacket cut away from the waist down revealing an underskirt beneath. One form of the polonaise was known as the Dolly Varden, after Charles Dickens's fictional 18th-century heroine, Dolly Varden in Barnaby Rudge, who was known for her rather flashy clothes. 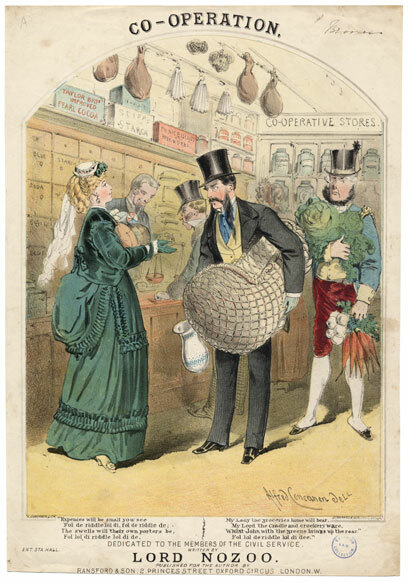 This music sheet cover celebrates the growth of the Co-operative movement and the spread of its shops. Co-ops were first formed in Britain in the 1840s, and were owned by and run for the benefit of their members. Shoppers could become members and any profits that were not ploughed back into the business were redistributed to members (according to how much they had spent in the shops) by a dividend, known universally as the 'divi'. Co-operative stores gave many working class families access to products that they couldn't previously buy, like fresh vegetables. This song not only celebrates the movement, but satirically contrasts its ideals with the class structure of the time. This rather comical scene shows a well-to-do family, or 'the swells' as they are called in the song, on a shopping trip with a disgruntled-looking footman. The song is dedicated to the members of the Civil Service, probably as a joke. Families like this would not have concerned themselves with mundane tasks like grocery shopping. It would have all been done by their domestic staff, but not the footman! It was the music hall that created the popular market for illustrated sheet music. Stars such as George Leybourne, Arthur Lloyd and other ‘swells’ were idolised like pop stars and the words and music of their songs were much in demand. In the 1870s, a popular song could sell 80,000 music sheet copies. By 1888 there were nearly one hundred music shops in London. The publishing of illustrated music sheets had become a very lucrative business with relatively low overheads. The lyricist and composer might get just £5 per song, but since publishers realised that a good cover illustration could sell thousands of copies, the artists could receive as much as £20. There were no copyright regulations until 1882 and music was often adapted or pirated without any fee to the original composer or lyricist. By the 1890s publishers began to reproduce photographs of singers and stars on the front of music sheets. This new technology heralded the decline of the illustrated music sheet. They were slowly replaced by those featuring a photographic image surrounded by a selection of novel letterforms. Most music sheet covers that find their way into the museum no longer have the original music attached. W.E. Imeson who wrote the first book on illustrated music sheet covers in 1912 advised his readers to carefully trim the covers from the music and frame them. Do not heed his advice - a cover with music attached is now far more valuable. 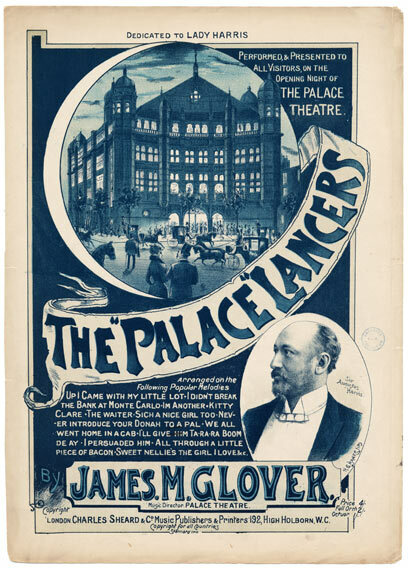 The Palace Lancers music cover celebrates the opening of the Palace Theatre of Varieties in London's Cambridge Circus. The theatre originally opened in 1891 as the Royal English Opera House, built by D'Oyly Carte to house Sullivan's serious operas. This was to placate him for writing the more lucrative operettas with Gilbert. When the opera house failed to attract business, successful producer Sir Augustus Harris took it over and opened it in November 1892 as a variety theatre. At the end of the 20th century, as the Palace Theatre, it became the home of the long-running musical Les Miserables. The image on the cover depicts the front of the theatre and Harris, who had received his knighthood in 1891. The cover design, featuring roundels, is a style that is typical of the illustrator H.G.Banks. This song, sung by Howard Paul in one of his popular entertainments, probably in the early 1870s, satirised the exploits of African explorer Paul Du Chaillu. 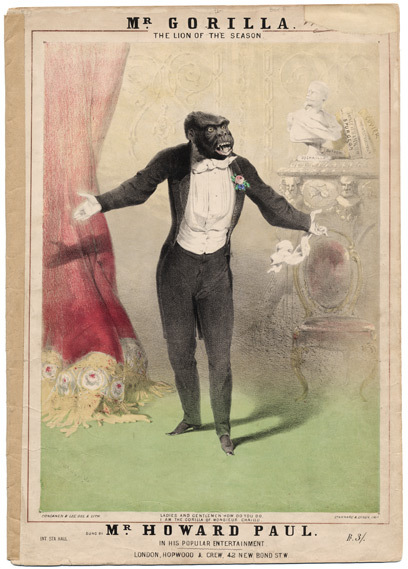 The song begins with the lines 'Ladies and gentlemen how do you do, I am the gorilla of Monsieur Chaillu'. Paul Chaillu was probably the first white man to see a gorilla. In his 1859 book Explorations and Adventures in Equatorial Africa he tells the story of his travels, including chasing the gorilla, and cannibal tribes which filed their teeth to keep them sharp. He claimed to have travelled 8,000 miles on foot during his journey. He shot and stuffed 2,000 birds and brought back the first specimen gorilla. However people ridiculed his achievements and coined the phrase 'Du Chaillu' , referring to someone who would tell wild stories. Nevertheless, Chaillu's expedition was defended by the Royal Geographic society of Great Britain. It is thought that Chaillu was the inspiration for the book Tarzan of the Apes written by Edgar Rice Burroughs. Bother The Men was a topical song sung by Isabelle Hill, or Mrs Howard Paul, probably in the early 1870s. This illustration shows her dressed as the fictitious Women's Rights campaigner 'Miss Grym', lecturing on Women's Rights. The suffrage movement began to cause a stir in London at the turn of the 20th century when women campaigned for the right to vote. However women had been campaigning for rights to land, property and inheritance long before this. Mary Walker, whose name appears on the spine of one of the books in this illustration, was an American feminist who was the first woman doctor in the American Civil War in the 1860s. She was arrested several times for masquerading as a man and published two books in the early 1870s. In their bid to raise public awareness of their fight suffragettes gained a reputation for being loud, aggressive and unfeminine. 'Bother the Men' seems to satirise such women. The Belle of Belgrave Square or Lady Audley's Kitchen Maid's Secret. This music hall song refers to the popular novel Lady Audley"s Secret, which was written by Mary Elizabeth Braddon in 1862. That was a lurid and melodramatic tale of bigamy, gold- digging and murder amongst the aristocracy of London"s Belgravia. The young, beautiful and gracious Lady Audley, who recently married the elderly Sir Michael, has a dark and sinister secret, and only her maid knows the truth. Lady Audley is driven to increasingly desperate measures to keep her secret, and eventually goes mad. The book became a sensation, and was frequently dramatised in late Victorian London. This song parodies the book. Lady Audley"s maid also has a secret - the young man she is seeing. As he creeps through the house for a clandestine meeting, he has a noisy accident, that gives the game away. The music sheet cover includes a short verse that explains the scene: 'Oh! headlong in the dark I went, and with my arms outspread, Down came champagne and port wine bottles, smashing on my head, I felt the Port Wine trickling down my forehead, face, and neck. Then heard a loud voice shouting out a policeman go and get.' Buying this piece of sheet music would have cost you two shillings and sixpence, which today would be about £5.50. 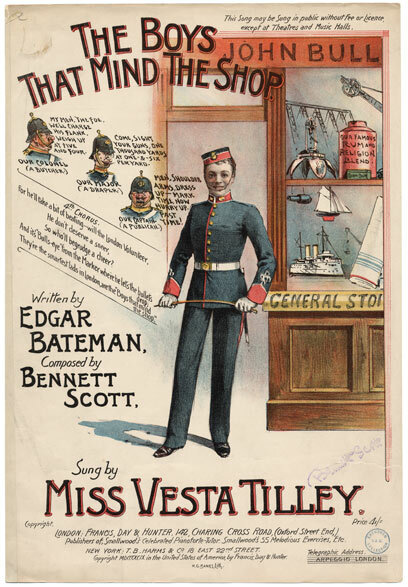 Vesta Tilley is depicted on this music sheet cover in dapper, close-fitting military uniform, one of the costumes that made her such a successful male impersonator. She was a huge draw on the music hall stage strutting about immaculately dressed as a serviceman, policeman, or man about town, at a time when women weren't seen wearing trousers. 'The Boys That Mind The Shop' was written by the author of music hall songs, Edgar Bateman. It poked gentle fun at one of the Rifle Volunteer battalions, part-time regiments formed in 1859 to supplement the regular forces to defend Britain against invasion or to enforce domestic order. A 19th century 'Dad's Army', they were known as 'Saturday Night Soldiers', which was when they did their training. Tradesmen and professional people alike joined the units, which is why this illustration by H.G. Banks depicts the butcher and draper as a major and captain. The song claimed that they were good shots who got bulls-eyes in rifle shooting and so deserved cheering, not sneering! When they weren't training to mind ' the shop' (Great Britain), a lot of volunteers really were minding shops - in this case a rather military shop which even features a tin of the dangerous dum-dum bullets. By 1908 the Rifle Volunteers were taken over by the Territorial Army, which still exists today. Born in 1842, George Leybourne started off singing in the East End under his real name, Joe Saunders. His big break came when he was engaged for a year at the Canterbury Music Hall at £25 a week. The song 'Champagne Charlie' was such a hit that it sent his wages up to £125 per week. He was the Victorian equivalent of a film star and lived the lifestyle to match his image, riding around London in his own carriage and four horses, with a selection of beautiful women. He dressed the part too, in a shiny top hat and fur collared coat and grew huge whiskers known as 'Piccadilly Weepers'. The song Champagne Charlie earned him the sponsorship of champagne producers Moet and Chandon because of the advertising he provided for their company. They gave him a retainer and supplies of their product. His lifestyle caught up with him eventually and he died in 1884 at the age of 42. Hetty King was a male impersonator who worked in music hall in the early 20th century. Male impersonators like King and principal boys' in pantomime who looked entirely feminine. This music sheet, dedicated to Hetty King and featuring a photograph of her, is for a piano solo of a two-step, a ballroom dance. It is based on the music hall song 'I'm Afraid to Come Home in the Dark' that played on the discrepancy between appearance and reality. The young man tells his new wife that he doesn't come home till dawn because he is afraid of the dark (which we don't believe), but there is an extra edge to the joke because the young man on the stage is really a woman. Hetty was best known for her songs 'All the Nice Girls Love a Sailor' and 'Piccadilly'. She continued working as a singer until she was in her 80s. Ada Reeve gave her first performance at the age of four in the pantomime Red Riding Hood on Boxing Day 1878 at the Pavilion Theatre in London's Whitechapel. She went on to make her name in George Edwardes' musical comedies at the Gaiety Theatre in the 1890s when she appeared in The Shop Girl opposite Seymour Hicks. She continued to perform as a leading lady in successful shows including Floradora at the Lyric Theatre. ‘She Was a Clergyman’s Daughter’ was a risque but seemingly innocent music hall song about a clergyman's daughter who wasn't quite as naive or charitable as she made out. It was the type of song that Marie Lloyd sang so well with knowing winks and gestures. 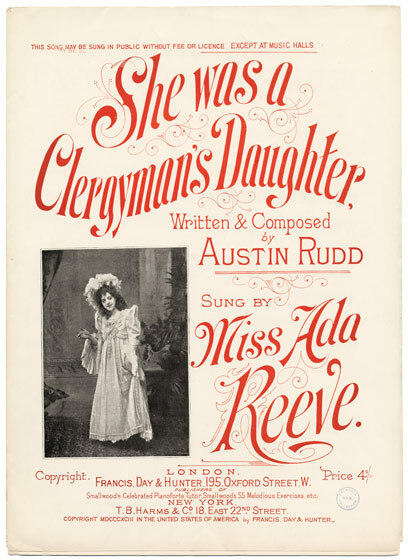 As we see from the photograph on the sheet music, Ada Reeve sang this in a demure costume of a beaded and flounced dress and bonnet. Ada Reeve’s career spanned over 70 years. She performed in comedy and vaudeville in South Africa, the USA and Australia. In 1935 she settled again in England appearing in cabaret, revue, theatre and, later on, film and television. She was a much admired performer well into her 70s and died in 1966 at the age of 92. 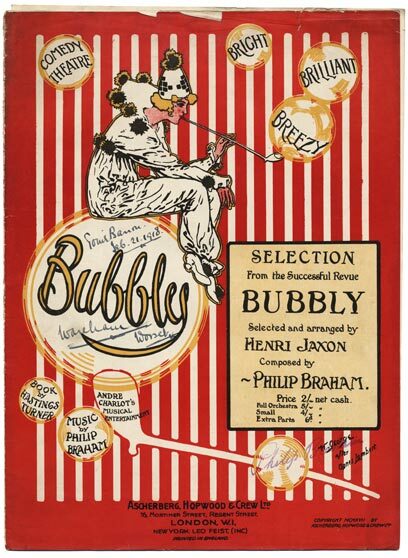 This music sheet is for ‘Bubbles’, a piano solo arrangement of songs from the popular revue Bubbly. It includes the songs 'We'll have a little Cottage', 'Reckless Reggie' and 'She'd a Hole in her Stocking'. Bubbly opened at the Comedy Theatre in May 1917 and featured 12 sketches, or 'Bubbles', as they were billed. 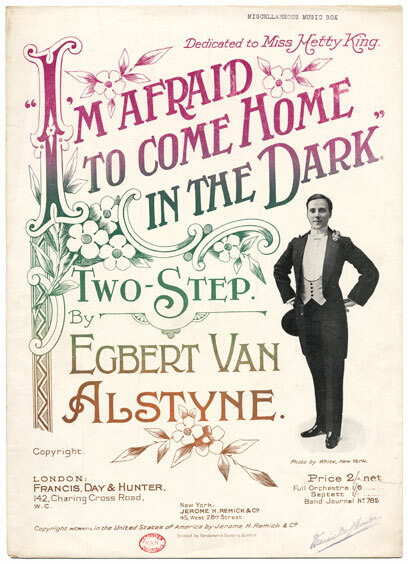 The public loved the light and frothy mixture of songs and sketches which were a much-needed antidote to the gloomy news about World War I. The cast included the 25 year old Jack Hulbert, who went on to become a star of musical comedy. Bubbly was produced by Andre Charlot, the Frenchman who was one of the most prolific 20th-century West End producers. He became famous for his series of intimate revues, some co-produced by the great showman C.B.Cochran. We offer a wide range of tours to meet your group requirements. Whether a group has a special area of interest, wishes to explore a particular gallery or just get an overview of the Museum's collection the Groups Team can help.